We offer a huge assortment of VPL Trainer Kit (VPL-PTPLC). 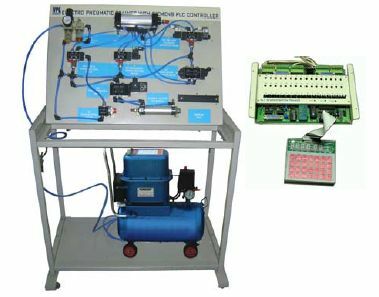 The kit is capable of being used to demonstrate the design, construction and application of electro-pneumatic components and circuits. 5/2 Solenoid valve, double, with LED : - 1 No. 5/2 Timer operated valve : It is designed to provided a solution for automatic changing for direction of flow of air for control/ automation. 16 input signals (24V) and 16 outputs for controlling the process on D-type sub connector. ZIF on front panel to load programs from EPROM and adaptor. Descriptive user manual with number of examples including description & fundamentals of PLC. RS232C port available for uploading & downloading of files from PC. Standard EPROM module which is affixed on ZIF socket to store the programmes provided with the trainer. Operating voltage : 220V, 50Hz AC, Â±10% at 50Â°C.